If you’ve ever seen the movie Up in the Air, you would have learned a thing or two from George Clooney on how to navigate through the world of business travel. When you’ve been in the air as much as his character Ryan Bingham has, you’ll too pick up on a few tips and tricks. Over the past 10 years, I’ve traveled quite extensively for business. One year, I spent over 120 non consecutive days at various Marriott hotels and pretty much lived out of my suitcase over a three-month period. With all that business travel under my belt, like Ryan Bingham, I’ve become quite efficient when it comes to packing for my trips. 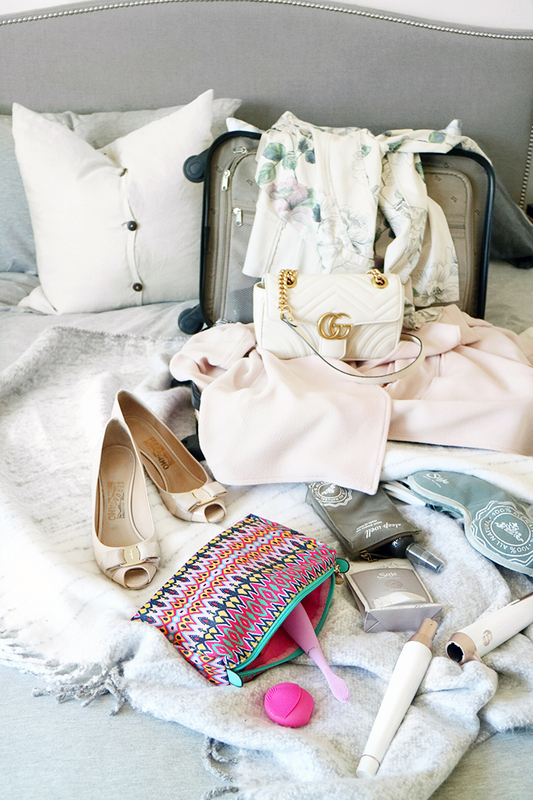 Unless I’m travelling for more than a week, I will only bring along a carry-on luggage to avoid checking in my bag because when you’re on the road that much, avoiding any unnecessary time spent at the airport is key! As I was packing for my business trip to Las Vegas last weekend, I thought I’d share some newly acquired essential beauty tools. 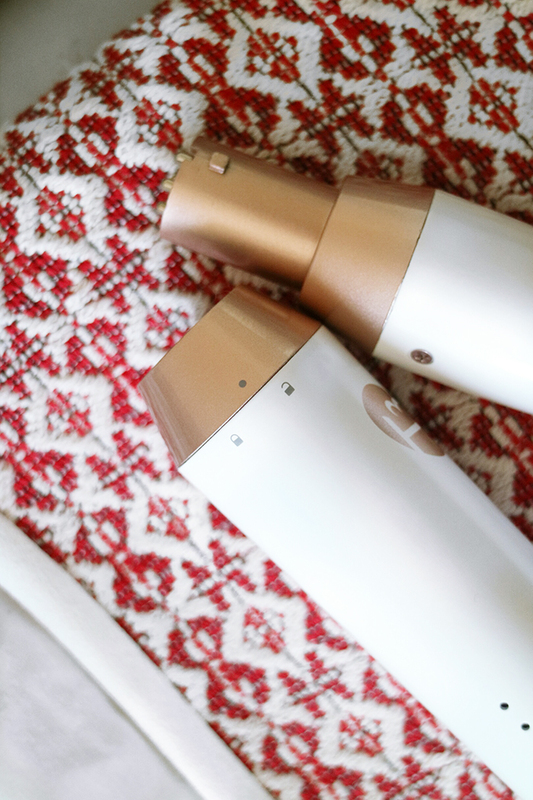 Keep reading to check out my list of carry-on friendly beauty tools! Aside from it’s versatility and option to customize with other T3 barrels that easily lock in (love the 1.25″ barrel), thanks to the Digital T3 SinglePass technology, this curling iron heats up fast and ensures even and consistent heating along the entire Tourmaline + Ceramic barrel – reducing the time it requires for the best tousled waves and potential damage to hair. Many people ask me what curling iron I use for my waves, this is it guys! I’m a bit of a germophobe, and we all know that planes and hotels are likely packed with them with given the amount of people coming and in out! Wherever I am able, I’ll try to reduce the number of germs I come into contact with. That’s why I love the Foreo line of silicone made products. I’ve chatted about The LUNA play before (read more here). Essentially a waterproof facial cleansing device that channels T-Sonic™ pulsations through soft silicone touch-points for deep and gentle cleansing, its like giving your face a mini massage. This mini version is perfect for travel. I’ve recently added the ISSA toothbrush to my Foreo collection and couldn’t be happier with it. Aside from the fun and colorful smart Swedish design, it is extremely travel friendly. It comes with a soft sleek carrying case and USB charger which means you don’t need to worry about bulky charging units while you’re on the go. The best part? One hour of charge can last up to 365 uses! Similar to the LUNA play, ISSA is also made from a non-porous, quick drying silicone material that resists bacteria buildup and carries up to 10,000x less bacteria than other bristle toothbrushes. Both of these products though great for travel has made its way to my bathroom on a permanent basis! Both products are available exclusively at Murale by Shoppers Drug Mart. All the liquid products are travel sized, perfect for your carry-on bag. I love spritzing the Tranquility Balancing Mist made with key ingredients of Roman Chamomile, Orange, and Ylang Ylang in my hotel room before bedtime, creating a calming oasis for relaxation. If you’ve yet discover Saje’s products, GO NOW! They also have a collection of On the Go products including the Aromaroam Diffuser and Aromacar Diffuser that are wonderful to take along with you. 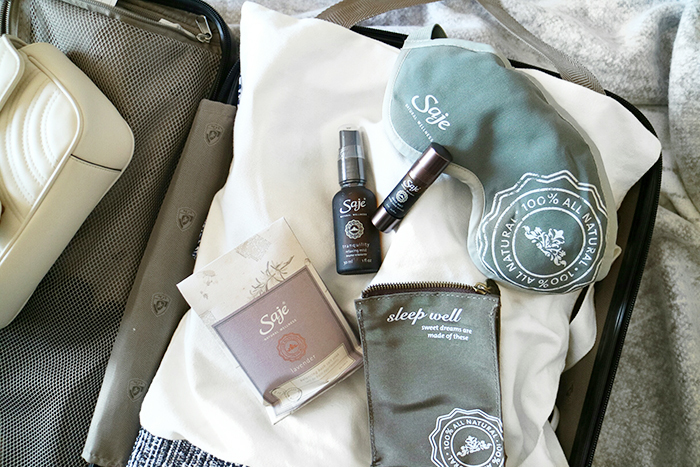 Travelling doesn’t mean you have to leave your most beloved beauty products and relaxation routines at home! Whether you’re planning getting ready for your next business trip or vacation, I hope you found these recommendations useful!